Syracuse, NY - Fred Voss chuckled at the thought. Voss was making that headline real Friday night, marking the culmination of an amazing journey with a diploma from Lansing High School outside Ithaca, 45 miles southwest of Syracuse. Voss, who already has a GED and has spoken out against hatred to high school and college students for nearly three decades, said he would accept it on behalf of the Jewish children who were never able to pursue their education. Voss grew up in Aachen in western Germany, not far from the borders with Belgium and the Netherlands, and had a normal childhood before his world came crashing down the day of his bar mitzvah in 1933. When the family returned home after the ceremony, soldiers barred the way. That began a six-year struggle for Voss and his family. He was beaten by members of the Hitler Youth and forbidden from going to school. The family home and textile store were destroyed during the infamous Kristallnacht. His father was sent to a concentration camp for two months. 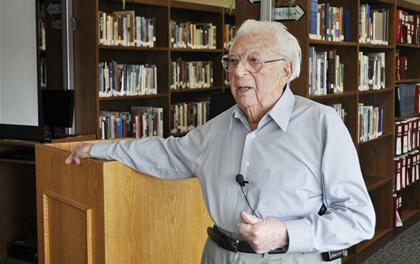 Though 67 members of his and his future wife’s family were killed, Voss escaped to England with his parents in early 1939, just months before Germany invaded Poland, starting World War II. In 1940, the family moved to New York City. After the Japanese attacked Pearl Harbor, Fred enlisted in the Army and was sent back to Europe, taking part in the liberation of Paris and later helping to remove mines the Nazis had left behind in his homeland. After his discharge, Voss took a low-level job at a textile factory in New York City and worked his way up to vice president before retiring in 1985. At the urging of Nobel Peace Prize winner and fellow Holocaust survivor Elie Wiesel, Voss began publicly speaking 27 years ago about the atrocities inflicted by the Nazis. And it has reverberated at Lansing High School, where Voss has spoken to sophomores every year since moving a decade ago to Ithaca, where his daughter lives. Co-salutatorian Sally Stoyell, one of about 100 students in the graduating class, has heard that message and is honored to share the stage with the school’s oldest graduate. Though Voss did receive his GED through Operation Recognition, a government program for veterans, this diploma is very special to everybody, including Voss’s 91-year-old wife, Ilse, whom he met in London during the war when their refugee families shared the same boarding house. She had been forced out of her home in Austria and never received her high school diploma. Voss, who wrote a memoir titled “Miracles, Milestones, and Memories,” recently gave his final talk at Lansing—he’s retiring again—and says his past is no longer so haunting.